Leaving Essex early in the morning, we were graced with glorious weather that would allow us to make our final preparations for hurricane Irene. The trip from Essex to Vergennes was a short 12 mile transit. Seven of those miles were up the Otter Creek, which is always a glorious trip. It’s a totally different way to see a very familiar landscape. 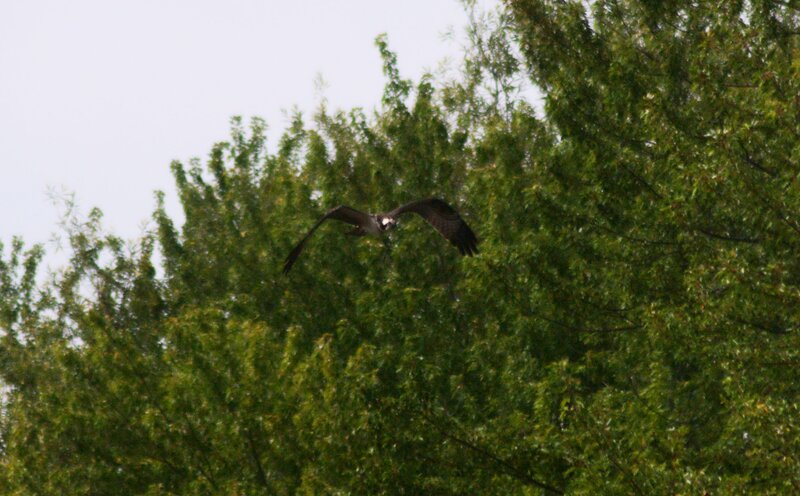 Osprey abound, and we were lucky enough to catch sight of a few of them catching fish. It was pretty difficult to stay on bow watch instead of wildlife watch. 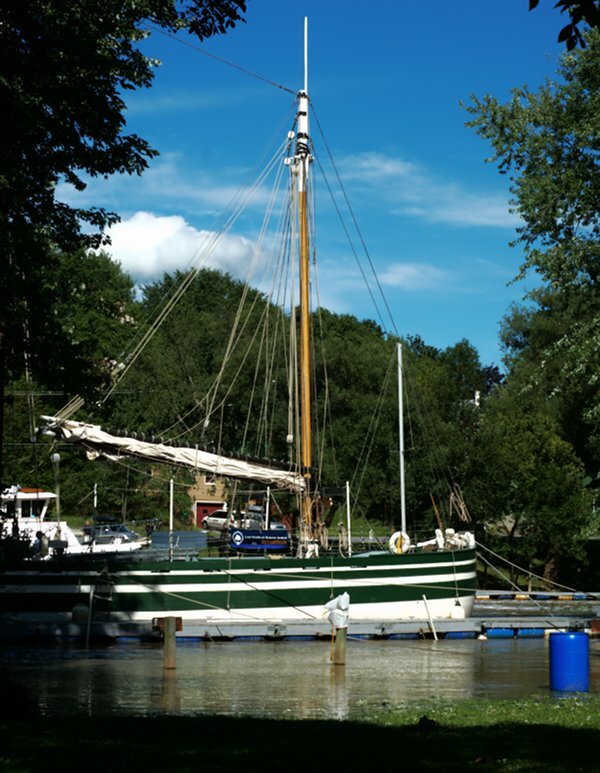 Once we got to Vergennes, we set our anchors and made lines fast to trees on shore. As we decided where to put them, we were thinking about how high the water could possibly rise, and decided to put them higher than we thought was strictly necessary. The moment we had the anchors set and Lois made fast, the Oocher was sent back down the creek to North Harbor, where the Philadelphia II was getting moved around in preparation for the storm. Here, the stalwart Oocher got to play the role of Churchill, while the diminutive Red Oocher took the role of bow thruster. The Philadelphia II makes the Lois look responsive and highly maneuverable, so getting her around into the shelter of Basin Harbor was an exercise in planning ahead and quick responses. She ended up tucked away in the back of the harbor with no excitement, and a handful of anchors were put out in preparation for the storm. Friday and Saturday were great days, with Saturday being Vergennes Day. Falls Park, where the Lois was docked, is a hidden treasure for Vergennes, and having the Lois there highlights the potential of the area. We were visited by both new visitors being directed to us from the main festivities, as well as old friends coming back to see us while we were in the area. Many of the questions revolved less around the history behind the boat, and more about the future – were we going to be ok for the hurricane? Seven Days came by and did a great spot on both Vergennes Day, Lois McClure, and the upcoming hurricane. We preemptively cancelled our public hours for Sunday and were thankful we made that choice. The day started with a drizzle, and the rain and wind built from there. By evening, it was turning into a real storm. We had three people staying aboard for the night, as hurricane watch: Erick, Len, and myself. Early in the evening, Erick and I went to check on the Philadelphia II, and make sure everything was doing ok – trees were down on the road everywhere, and when we got to the waterfront, it looked as though the lake was doing a small scale Perfect Storm imitation. Thankfully, the Philadelphia II was fairly sheltered and the lines set earlier were holding well. Upon our return to the Lois, we found that the water had risen 10″ in the two hours we had been gone, and was still going up at a rapid rate. Once we got back aboard the boat, the three of us set up a watch schedule. Each of us stood watch for three hours, checking on lines every half hour or if a strange noise happened. It was surprisingly mellow in the hold. We had covered all the hatches, including the stairwell, and sealed the boat from the rain as best as possible. Until you poked your head above deck, it felt like a regular rain storm. Once above deck, it proved to be different – wind howling about, with the trees looking as though they had been turned inside out, rain coming down in buckets, and always the water higher than the last time you looked. Suddenly, it was clear that we might have underestimated how high to put our shore lines. The boats on the other side of the river from us had a tenser time of it – they were on the outside of the bend and any debris coming downstream was more likely to come slamming down their sides than into us. They were up all night long, keeping a watchful eye on the docks and creek. The Vergennes public works crew under the direction of Jim Larrow did a stellar job keeping every thing as controlled as possible. They worked tirelessly keeping the docks rising with the water, and regularly came back to check that everything was going smoothly on the waterfront. In the morning, the water was still coming up, though much more slowly. We spent the day doing the myriad of chores that accumulate on a boat when it travels and waiting for the water to level off. By Monday night, our patience was rewarded – we started to see a water line on the poles on shore as the water slowly started to go down. The current was still screaming down the river, and every so often a large piece of debris would go by. Seeing the conditions, it was decided that we would wait for a few days and let the creek drop down a bit before heading back out. We settled down to watch the water drop and prepared for ourselves for the race down the creek on Thursday.